A tidy package with multiple levels for living, outdoor spaces, and views. 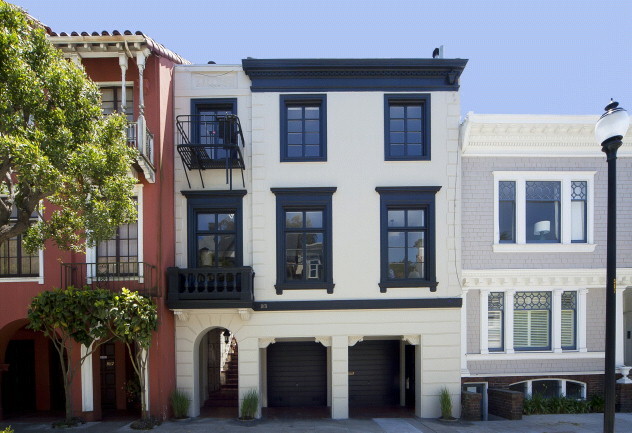 Built in 1936, our Home of the Week is located in San Francisco’s Presidio Heights neighborhood, not far from the Presidio golf course. With multiple en-suite bedrooms, expansive outdoor space, and city views, it’s a rare oasis in the city. This three-story, traditional-style home is outfitted with three en-suite bedrooms on the top floor with an exquisite stained-glass skylight in the hall, and an additional bedroom and half-bath on the main level. The luxurious top-floor master suite was expanded by combining two bedrooms and includes southern views, a dressing room or office area, closet, and a generous soaking tub. From the living room, French doors open onto a grand deck overlooking the deep landscaped garden. Au-pair and garden levels offer the potential for growth and greater living space. The deep, landscaped garden is overlooked by a grand deck off the living room.